Zhongyang Street is a pedestrian street full of restaurants, vendors, malls, and stores. The street is blocked for several blocks from vehicles. However, you should keep your eyes and ears alert, for any motorbike or bicycle passing by. The street is bustling with locals and tourists every night! 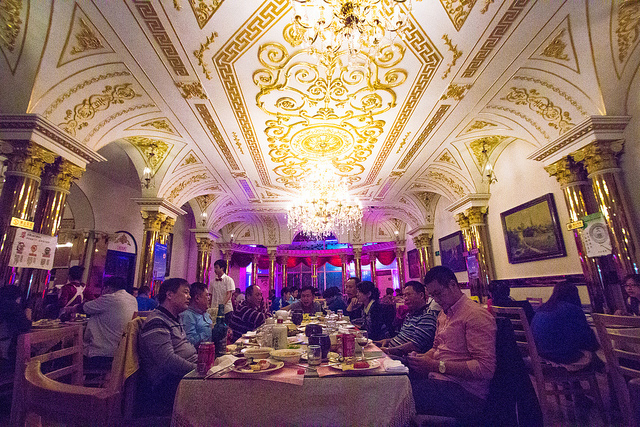 There was one restaurant on Zhongyang Street that specialized in a cuisine that wasn’t Asian. From the outside, it looks like a typical Chinese restaurant, but to Westerners, the name might be misleading. I thought the English name “Huameixicanting” was a typo for Chinese/Mexican food. Translating “華梅西餐廳” in Google Translate gives you “Chinese Macy Restaurant”, which makes no sense. Instead, breaking it down to 華梅/西/餐廳 (Hua Mei / Xi / Canting) gives you Hua Mei / West / Restaurant. Then it tells you it’s a Russian restaurant; the major city west of Harbin is Moscow. Harbin is known as the Eastern Moscow. When I walked inside Huameixicanting, I was blown away by the interior design and how elaborate it was. I had never seen Russian architecture and interior design before. The first floor had tables on the side with a large open area in the middle that served as a waiting area. The second floor was filled with tables and had a Kremlin style interior. I felt like I was in a completely different world, in a country already far away from home! I was just mindblown. The menu was in Chinese, so Pastor Chan ordered the food for the four of us. We were served bread and soup before receiving the rest of the dishes. Bread served as the staple, unlike how rice is for the Chinese. We dipped the bread in our soup, and the stews we ordered. I was surprised to find out we had onion rings, which is also popular back at home in the States. Yay for onion rings and a break from Chinese food tonight! The total cost came down to ¥114 RMB (~$18.54 USD). In other words, that’s ¥25.8 (~$4.64 USD) per person. I also found out that because Russia was under the Soviet Union, there’s Russian and Eastern European cuisines. The former Soviet Union includes a number of present-day countries including Georgia, Belarus, and Ukraine. So there’s perhaps a slight misunderstanding about whether a particular dish is Russian or not, because the Russia Federation is the largest and biggest country among all post-Soviet states. For example, the lamb stew I had earlier isn’t Russian, but it’s Georgian. Georgia used to be part of Soviet Union, so the lamb stew is Eastern European but not Russian.